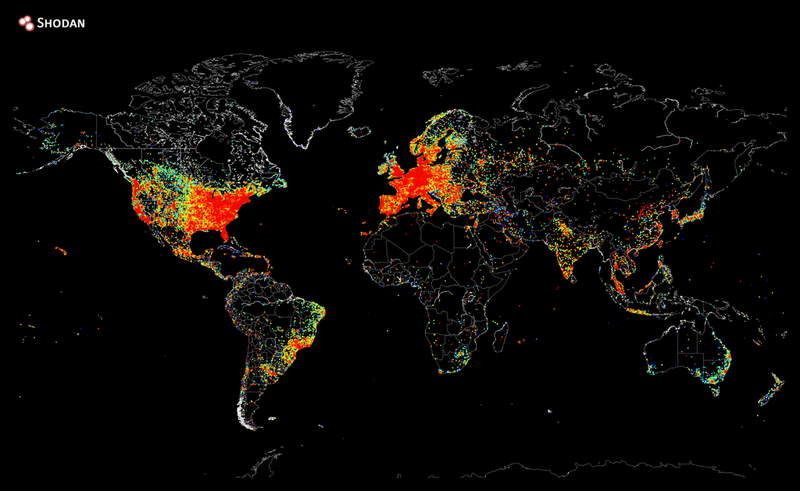 This map was made on August 2 by John Matherly, the founder of Shodan, a search engine for internet-connected devices. Matherly, who calls himself an internet cartographer, collected the data to put it together by sending ping requests to every IP address on the internet, and storing the positive responses. A ping is a network utility that sends an echo-request message (known as a packet) to an IP address—the internet's version of "hey, are you there?" That part was relatively easy compared to the visualization process, says Matherly. "It took less than five hours to gather the data, and another 12 hours or so to generate the map image." For that, he used the matplotlib plotting library in the programing language Python. With its rainbow of connectedness, the map is similar to one produced last year anonymously—which was illegal—and also to this project by CAIDA (these links and the credit to CAIDA has been updated). Although Shodan is well-known for its potentially shady practices that prey upon insecure networks, ping requests—the same thing your internet provider uses to test speed and data loss—are completely benign, Matherly says. "We've just advanced enough in technology where we can do it on internet-scale."